UPDATE: The food is now more toasties, cheese boards, ice cream sandwiches and salted caramel chocolate cookies. Great infused gins and rums, and always interesting creative cocktails. The replacement Hooch. 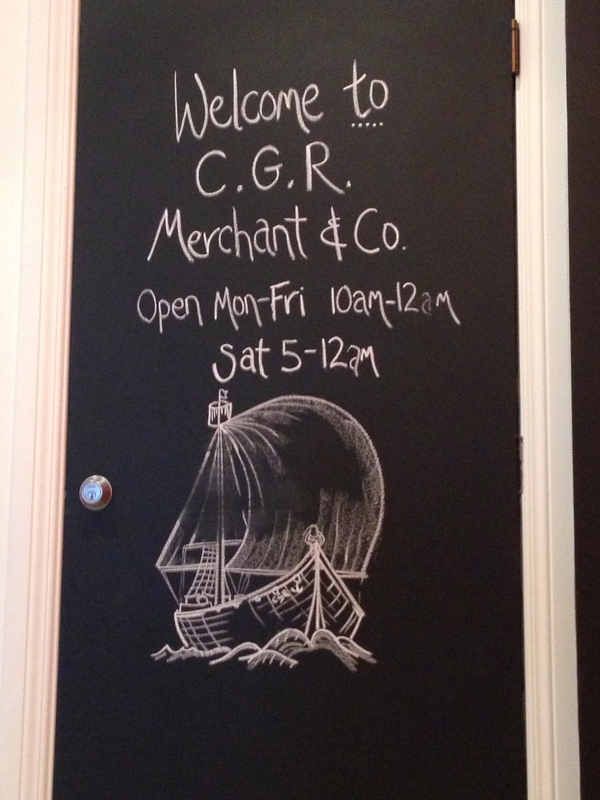 Now C G R (Coffee, Gin, Rum) Merchant and Co upstairs on Courtenay. As you can imagine, coffee, gin and rum are the focus of this bar, with the cocktail list divided into gin and rum creations of the week (although they offer to turn their hand to any other kind of cocktail if those aren’t to your liking). I had a gin fixer (spirits, no mixers) and he had a rum fizz (spirits with mixers). Mine was a lovely orangey number (strong but pleasant sipping) and his had a vanilla tone with milder taste (and probably all the more dangerous for that!). They infuse all their own gin and rum syrups, so there’s an interesting array of jars and ingredients apothecary-style behind the bar. I won’t repeat what was said in the Word on the Street article, but thinking about the Rum Diaries isn’t too far wrong. I definitely went away thinking English, Indian and colonists. The coffees include a Vietnamese egg coffee (apparently rum, coffee and condensed milk), something I shall definitely try next time, and a variety of Kenyan, Ethopian and Nicaraguan cold coffee infusions. I note they open 10am to midnight weekdays (from 5pm Saturdays), so you can get your weekday coffee fix should one of these brews become a must-have in your world. Might be interesting to pop in during the daytime to see how much following they’ve actually got. I also noticed from their facebook page that they have Gipsy Kitchen deli fare. Delishimo! (Especially the rhubarb and caramel scones if you can ever get your mitts on one of those). The evening we were there we partook of their goat cheese, honey and pear brushetta (nicely done), and noted a pea puree and ricotta brushetta, aged cheddar / pickle or beef / aged cheddar grilled sammies, and house baked beans (an intriguing bar offering), so the food aspect is suitably covered. The only criticism I had on our visit (6pmish on a weekday evening) was the music being too loud for conversing. As always with new places, I’ll see how a second or third visit goes down. 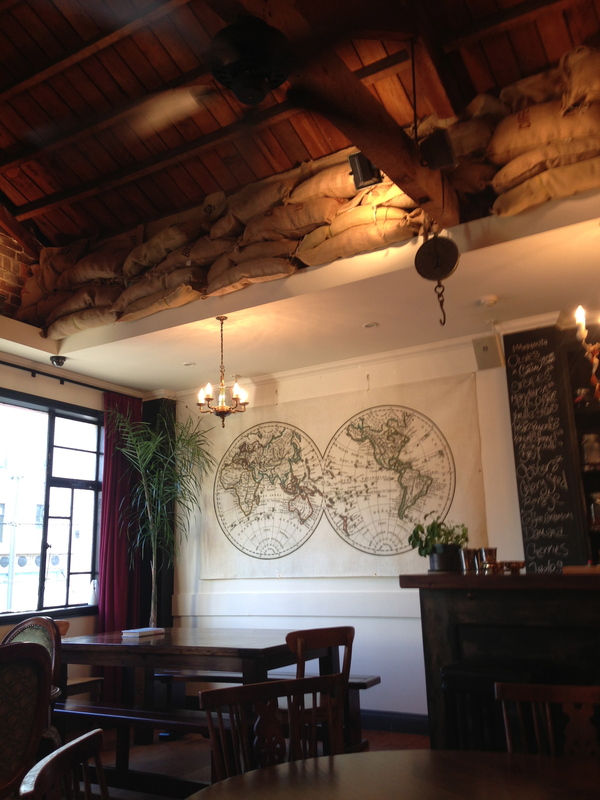 But so far, this really looks like another interesting gem tucked away in Welly. The coffees sound really interesting, especially the Vietnamese one. Hope you do get around to trying and posting your thoughts here.